Congratulations to our four winners of the OZ Giveway! You have until this Sunday, February 17th to comment below and tell me if you are in Vancouver or Toronto. Two winners from each city will be randomly choosen to go see this highly anticipated movie before its release on March 8th! What are you waiting for.... Step right up! I am in Vancouver , three blocks from Scotia Bank, living in a house from 1899. 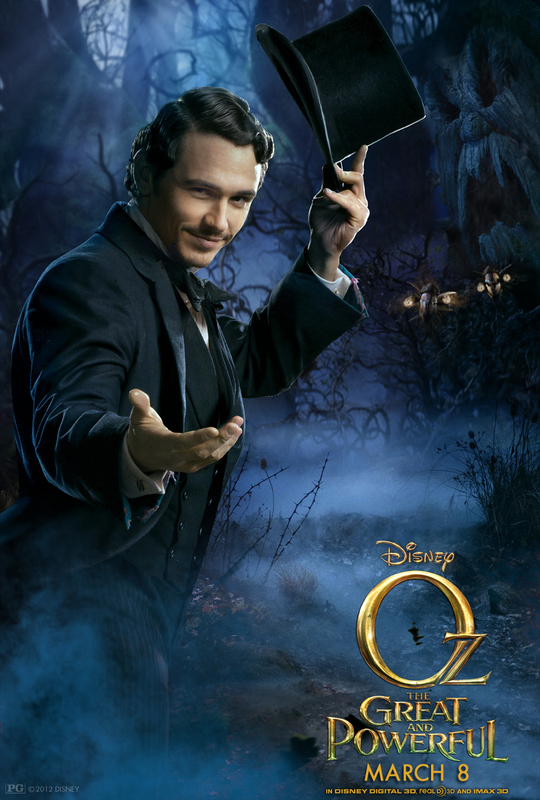 Looking forward to a new look at Oz and the Wizard. I am extremely excited for this movie, the Wizard of Oz has been my favourite musical ever since i was four. I live in Toronto and am looking forward to this new spin on a classic tale! Hello, Lee Ann! This movie looks most steamy, and I hope we have the chance to win and go and see it. We're in Toronto, and the Scotiabank theatre in Toronto is a great place to have it. In Vancouver, and would LOVE to go! My friend from way back East, Halifax, will be visiting, and would be awesome to be able to bring her! I am a big fan of OZ and steampunk! I directed a steampunk version of Love's Labour's Lost last summer and I'm having steam withdrawals! I think this movie might help to quench my thirst! Oops - I forgot - I'm in Vancouver - well, technically Maple Ridge. Im in Toronto and would be thrilled to win these! If nothing else (and there is plenty else), the cinematography looks fantastic!! Would love to see this movie. I live in Toronto and can't wait for the release!!! Please pick me - it would make my year!! Well, as we like to say in Toronto... "You're not in Kansas or Down Under!" But this movie looks like a good escape. I'm just a short drive from Toronto. The trailer really captivated the part of me that loves movies that offer escape from mundanity. Love to see it and write a review. Quite keen to see this. I think this 'prequel' sets some kind of record for time elapsed between movies. Set in a world where to an ambitious post-civil war huckster, magical, futuristic cities still look like an Art Deco dream of 1929. Bring on the flying monkeys! Resident of Lotusland. Wait, does anyone use that term anymore? Vancouver, by any other name. I'm in Vancouver and can't WAIT to see this movie! !